Abstract Lovers Sculpture, "Together Forever"
I have not personally seen it. It was bought as a gift for someone special to me and she loved it! The meaning behind it fit my love and feeling for her! Amazing job! "Love at its best - forever!" Wayan Rendah, if there are people who are not familiar with your work, I hope that this review will acquaint them with your work. The curves in your work are endless, entwining, touching, so full of expression of human love, in the US, in Canada, in Bali, in Java, wherever people are. The lines in the legs of this sculpture are strong, capable. I look to you when I want a sculpture that expresses love. Never am I disappointed. Keep up your beautiful work, Wayan. to Married couple: friends/parents/own marriage wedding thank you to a caring person who helps another. Strength in legs entwining raised left leg supporting her. This was a gift for: a man who assists my sister who is ill.
"Perfect gift for a newly married couple!" 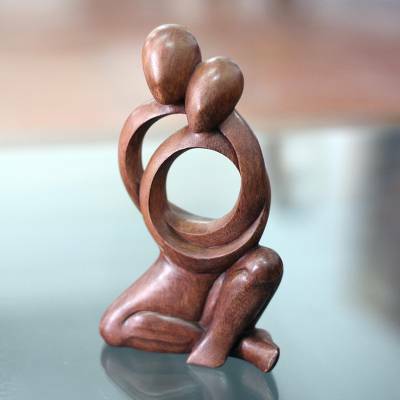 I knew when I saw this sculpture that it would be the perfect gift for Maria and Christian! They are a loving, spiritual couple. To my surprise, they videotaped when they opened the beautifully, hand wrapped gift. Their delight, and Maria's tears provided me with all the glee and feedback I needed. Their expression of love and gratitude topped off this experience. I highly recommend this product as well as Novica. Each item I have purchased has been beautifully and personally crafted. And, each was lovingly wrapped and in beauty and to protect the sculpture during it's long trip from Bali. I will buy from Novica again...and again! "Great material quality and design"
The design is really amazing as there are no "end lines" in this sculpture. Seems like it is one piece. Also the material is durable ans light. I accidentally dropped from 1.5m height and there was no damage. Really happy with that. "Gift for my daughter and son in law." This is so beautiful. I have to touch it every time I see it. My husband died of a brain tumor right after our first wedding anniversary, and I bought this for myself to always remember how wonderful our love was. "Perfect gift to a special couple in our family." This design emanates strength, warmth and love and is nicely executed. Very pleased. It's beautiful and a good size. The only issue is that it's a little shallow from front to back and therefore not as stable as it might be otherwise. The piece is art fully crafted and represents love in such a delicate and beautiful way. Perfect 5th anniversary gift!
" Absolute Beautiful Work of Art"
Gave this to my Son/Daughter In Law for their 5th Wedding Anniversary. They absolutely loved it, so much so that my Daughter In Law asked me a couple of days later for the Site name. She intends to purchase more (so do I) to put on their fireplace mantel where they put the 2 I gave them. The Artisan did an EXCELLENT job of sculpting! To top it off, there was a tag on each piece explaining what the sculpture meant/signified. They even kept the wrapping paper and the paper ornament attached to it and framed it to place beside each sculpture. Kudos to the Artisan, an absolutely beautifully sculpted piece of art/work! This couldn't have been any more perfect! It arrived so well packaged & protected, several layers of wrapping & a high quality gift box (if the purpose). This piece spoke to me for my beloved & now proudly sits on display for all to see!